The massive natural gas leak in Porter Ranch, CA, just outside of Los Angeles, has been temporarily capped. That’s the good news. The bad news is that the leak isn’t yet permanently stopped and that it has already done incredible damage over the 111 days it spewed methane and toxic chemicals into the air. The state of emergency called by Governor Jerry Brown is still in effect for what is being named the largest environmental disaster since the BP oil spill. Over 94,700 metric tons of methane has escaped since October 23, which is one of the largest leaks ever recorded. This incident has taken California two steps back in its progress towards greenhouse gas emissions reductions especially since methane is 87 times more potent of a greenhouse gas than carbon dioxide. For perspective, the amount of methane released so far from the natural gas leak will have the same impact on climate over the next twenty years as emissions from seven coal power plants. Despite these environmental crimes, not one person has been arrested, although this past week, the citizens of Los Angeles County have begun taking legal action. Southern California Gas Co (SoCal Gas), a subsidiary of Sempra Energy, is the responsible company for the Aliso Canyon Methane Leak, and is finally facing charges for this disaster. District Attorney Jackie Lacey announced the criminal charges filed against SoCal Gas for failing to immediately report the gas leak at its Aliso Canyon facility to the proper state authorities. The site leaked for three days before SoCal Gas officials contacted the city’s fire department. SoCal Gas has yet to release a full listing of the chemicals being emitted from the leak, furthering distrust and anxiety from the community. Local law firms have organized a website (www.porterranchlawsuit.com) for citizens to reach out if they have been impacted. More than 25 lawsuits have been filed pursuing damages from the SoCal Gas and Sempra Energy. For example, a family of an elderly woman has filed a wrongful death lawsuit against the gas company, claiming that the leaking chemicals led to the worsening of her health and untimely death this past January. Legal actions will certainly hurt these gas companies financially, but is this an effective way of enforcing the law? History says no. Time and time again, environmental crimes are punished with fines, and these disasters continue to happen putting the public at risk. New regulations, transparency, and stricter criminal enforcement on the individuals responsible very well could bring justice in these incidents. Crimes committed under a corporate veil are still crimes and should be treated as such. No amount of money will ever reverse the harsh health and environmental effects the Aliso Canyon Methane Leak is having on the region. But we can put into place policies that make corporations take the environmental risks of their operations much more seriously. A proactive justice process would be exponentially more effective means of dealing with environmental crimes than merely reacting after the fact. While we’ve all grown accustomed to seeing the words “natural”, “healthy” and “environmentally-friendly” thrown around in advertisements for a variety of consumer goods, it’s important to remember that household items are not the only things capable of being greenwashed – case in point, natural gas. The word “natural” has been used to connote things such as ‘green’, ‘healthy’, ‘non-toxic’. Many people’s cursory understanding of natural gas is that if it’s “natural”, it must be good, right? Unfortunately the truth about natural gas is more complicated. While it is true that natural gas emits far less CO2 than coal upon combustion, there are a host of other ‘fine-print’ problems that come along with the switch, most notably, fugitive emissions. Methane, a powerful greenhouse gas, escapes from wells and leaky pipes and valves into the atmosphere. Photo by Kevin Moloney, NYT. Fugitive emissions are the emissions not intended to take place and that usually result from pressurized equipment leaks. 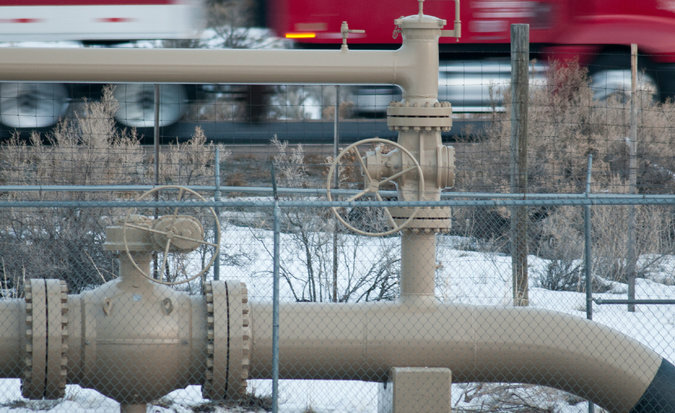 While these leaks are relatively tiny, when expanded to a large enough scale the amount of methane being leaked into the atmosphere can have a large impact on climate. While the EPA originally reported that average leakage rate in natural gas production was somewhere around 1.5%, a collaborative study by scientist from several universities and government agencies released this past October revealed that the figure should be much closer to 3%. 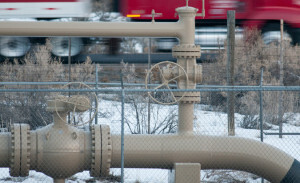 Even worse, there have been reports of methane leakage upwards of 12% at some production sites. Many climate change mitigation plans focus on reducing CO2 emissions, but methane and its effects should not be overlooked. The IPCC has reported that over a 100-year period, methane is 35 times more potent of a heat-trapping gas than CO2. When looking at the effects of methane over 20 years, this figure jumps to 87. Suddenly, that comparatively small amount of methane being leaked out of wells, pipes and valves is incredibly important. In other words, 1 ton of methane being released into the atmosphere has the same heat-trapping effect over a 20 year period as releasing 87 tons of CO2. 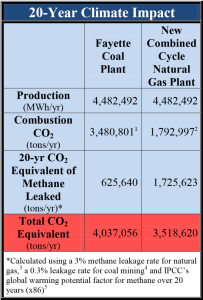 While the CO2 emissions from burning natural gas are about half what is produced by burning coal plant to produce the same amount of power, after accounting for fugitive emissions and converting leaked methane into CO2 equivalent (using the IPCC 87x factor referenced earlier), natural gas climate change impact is almost as bad as coal.